If you turned on the radio in 1951 to the tune of Les Paul & Mary Ford's hit single, "How High the Moon", you'd have heard sounds unlike anything prior... harmony vocals in perfect synchronization, layer upon layer of overdubbed rhythm, and that unmistakable lead guitar tone, bouncing right back at you like a rubber ball hitting a wall; no big deal by today's production standards, but seemingly impossible to be accomplished by only two people at that time, with only a single mono tape machine at their disposal; this was innovation and ingenuity at it's absolute finest, ushering in a new era of recording techniques that would become common practice for decades. 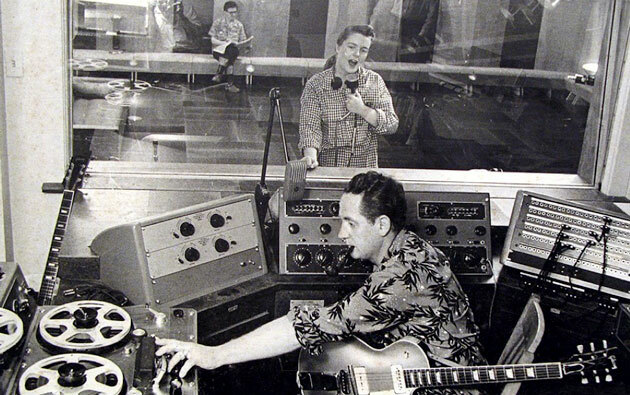 While books have been written on the many technical innovations of Lester William Polsfuss, aka Les Paul, it was a simple discovery while experimenting with his first tape machine that led to one of the most-used audio effects of the past 60 years. While Les was collaborating with Bing Crosby in the late 1940s, an innovative German tape machine called the Magnetophon was brought back by an Army engineer as a spoil of war, using magnetic heads to record sound directly onto a reel of tape. 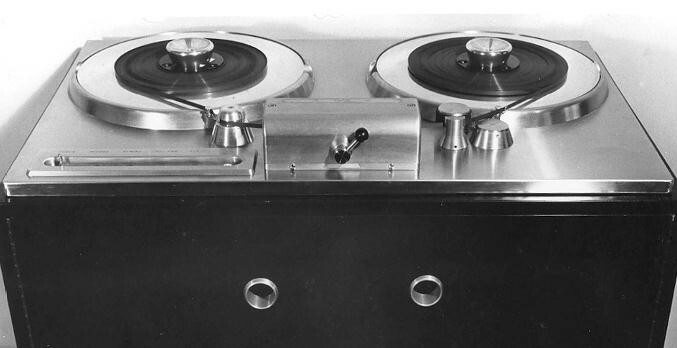 After witnessing a demonstration of the machine at MGM studios in Hollywood, Crosby funded the initial development and production of the Ampex 200, a mono reel-to-reel tape machine based on the German machine. Bing kept the first unit for himself, and dropped #2 off at Les' front door. Paul soon discovered that the playback head reproduced the incoming signal milliseconds later than the record head captured it, and by varying the space between the heads, this delay time could be made shorter or longer. Blended with the direct sound of his guitar, it created a single repeat "slap-back" echo effect, which became a signature of Les' guitar tone on his many hits of the early '50s. The duration of the effect only lasted as long as the tape length, however, so Paul would shorten and "loop" the tape reel, making the effect infinite. Musicians and record producers everywhere were scrambling to achieve this sound on their own, and by 1954, producer Sam Phillips of the famed Sun Studios in Memphis had two Ampex tape machines installed for this very purpose; one built into the console for recording, and another dedicated solely for slap-back echo, which became a staple of the Sun Records sound, most notably with the guitar playing of Scotty Moore on Elvis Presley's first big hit, "That's Alright", and subsequent releases that would shape the sound of modern music. 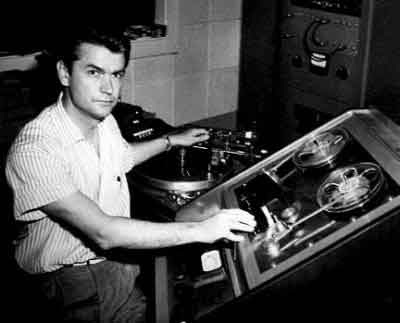 Sam Phillips working on one of this Ampex 350 tape machines at Sun Studios. Guitarists still couldn't obtain this sound in live performance, though, until Illinois electronics wiz Ray Butts modified a Gibson 15-watt combo amp with a built-in tape echo at the request of his friend, guitarist Bill Gwaltney. 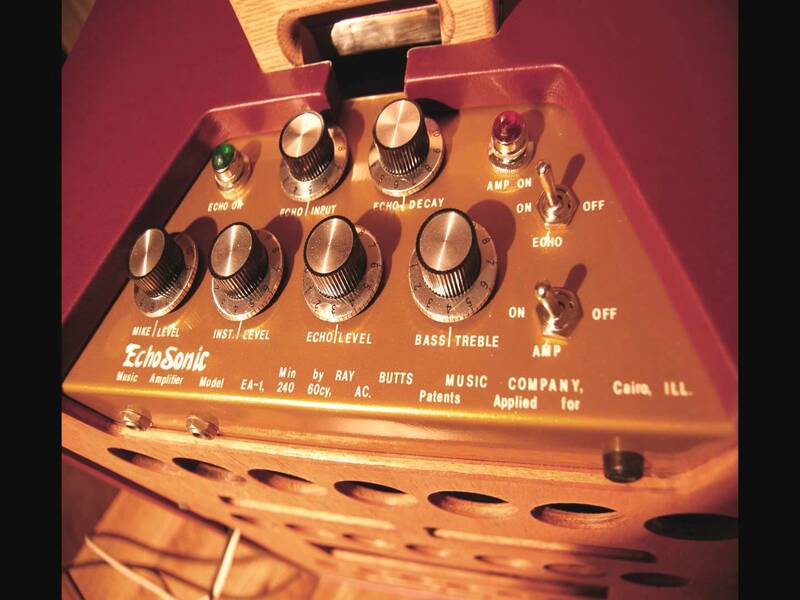 Named the EchoSonic, it featured a fixed delay time, optimized for the popular slapback sound, and was eventually bumped up to a punchier 25 watts using 6L6 output tubes (as opposed to the 6V6 circuit of the original modded Gibson). 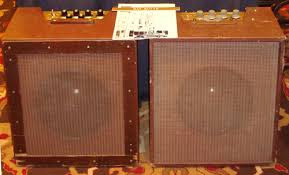 Butts took the second unit to Nashville, looked up Chet Atkins in the phonebook, and talked him into trying it out; Atkins used it at the Grand Ole Opry that very night, and agreed on a transaction for his new favorite amplifier. Atkins used the EchoSonic to record his first hit single, 1955's "Mr. Sandman", and on countless gigs and sessions to come. 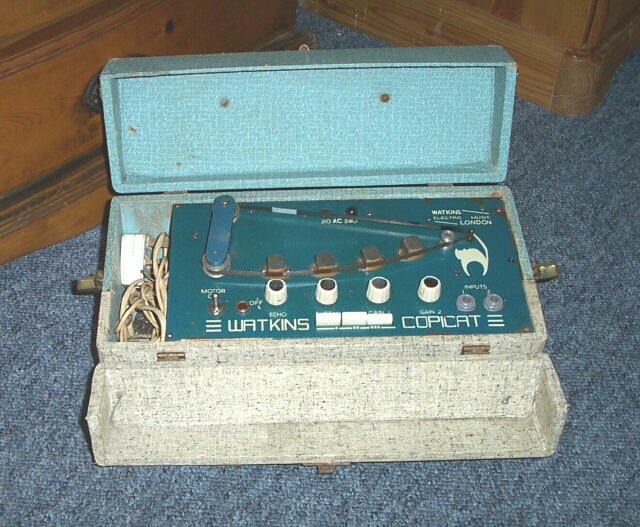 Butts worked with Atkins on the construction of his home studio, and also created a humbucking pickup for Chet's Gretsch guitar that may predate the Gibson PAF; it was later named the Filtertron and featured on Atkins' signature "Country Gentleman" model. After hearing Atkins on the radio, Scotty Moore called up Butts and ordered an EchoSonic for himself; Carl Perkins soon followed suit. 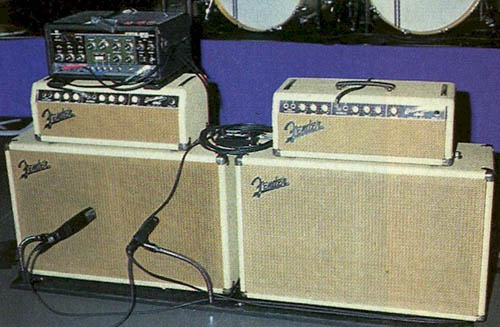 By all accounts, these amps were built impeccably well, with point-to-point wiring and military spec components throughout, and aside from the normal wear-and-tear of the tape mechanism, held up well over the years. 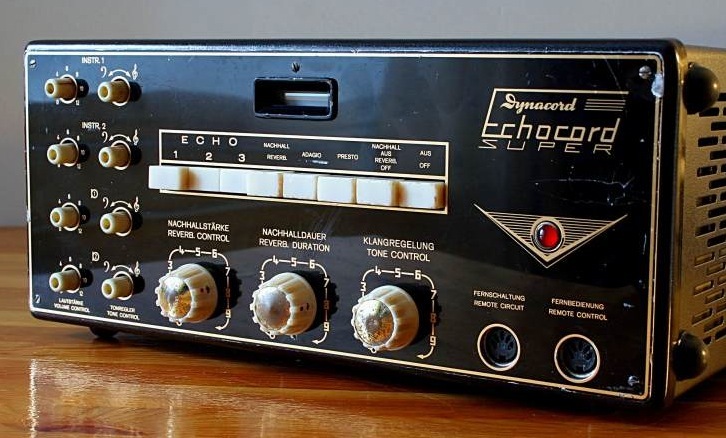 Although less than 70 units were produced, the legacy of the EchoSonic was long-lasting, and influenced the standalone tape echo units that followed soon after. Two EchoSonic combos, an early model (left), and a later build (right). EchoSonic control panel (left), and interior rear view (right). 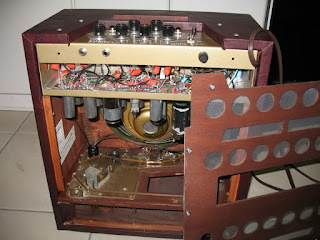 Note the tape echo unit on the bottom. 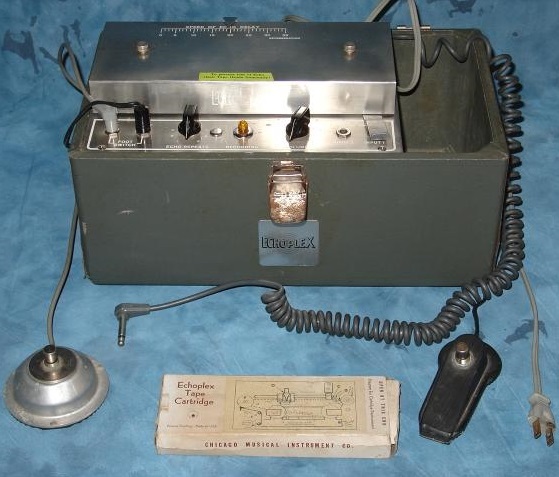 1958 saw several major developments in the world of tape echo; first, in England, where Charlie Watkins developed the first portable self-contained tape echo, appropriately named the Copicat. It featured a tube circuit with three fixed playback heads, individually selectable with ability to be combined for multiple echo options. The very first unit was sold to Johnny Kidd of The Pirates, who scored a number one hit in 1960 with "Shakin' All Over" and influenced many British Mods to come over the next few years. Watkins soon formed the Watkins Electric Music company (WEM), building very popular PA systems as well as other musical equipment, and the Copicat became a hit in England, particularly after switching to less expensive transistor circuits in the mid-60s. 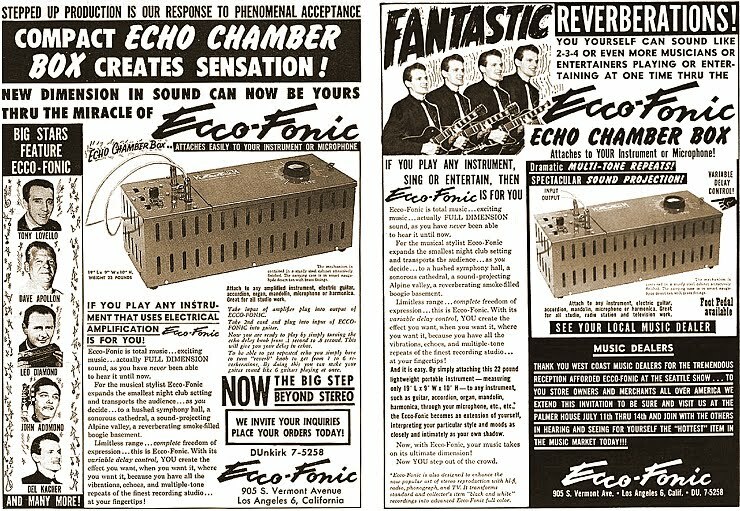 Around that same time, in Hollywood, the Ecco-Fonic was invented by Sunset Strip electronics shop owner Ray Stolle, the first to feature a variable delay knob to control the timing of the echo. Stolle quickly teamed up with fellow Californian Leo Fender, and although the original design was rough and a bit premature, was rushed to market in 1959, as the demand was clearly evident. The unit proved to be unreliable, requiring constant maintenance and tape replacement, and although many revisions came to pass (including the switch from tube to transistor many years before the rest of the industry), the Ecco-Fonic never caught on as widely as hoped; it's quirky design merely teased and influenced what was to come. Also in 1959, Akron, Ohio electronics tech Mike Battle and guitarist Don Dixon began modifying the EchoSonic circuit in a standalone unit, also featuring a variable delay time via slider control of the playback head, and eventually named it the Echoplex by the time the first prototypes were available in 1963. The real jem of this design was a removable cartridge for the actual tape reel, protecting the tape from dirt and damage, and enabling easy replacement when necessary. This propelled the Echoplex to the forefront of the industry, earning a patent for Battle in 1964 and large-scale production and distribution by Market Electronics of Cleveland, his place of employment. Originally using all-tube circuitry, the full, warm sound of the unit, combined with reliable engineering, was vastly superior to any prior or current competition. 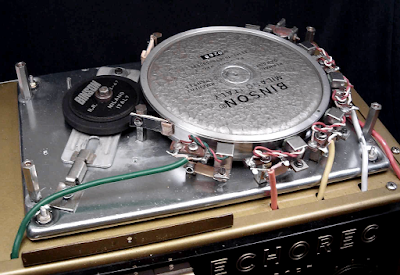 Revised in the later 60's as the EP-2 (thereby designating original units as EP-1) and adding Sound on Sound to it's features as a primitive form of looping based on the length and speed of the tape, the Echoplex quickly became an industry standard (Fulltone currently makes a modern recreation of the EP-2 unit called the Tube Tape Echo). An original Maestro Echoplex (left), and EP-2 (right) with larger case for cable & pedal storage. As transistor circuits began replacing vacuum tubes in the late 60s, Battle designed the EP-3 solid-state model, now under the Maestro brand in 1971. 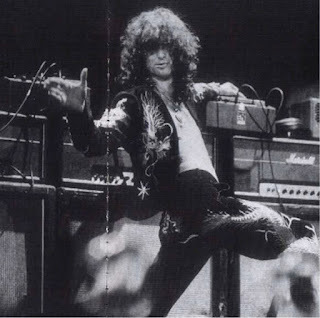 Although not fond of the sound himself (he left the company soon thereafter), this design became the sound of 70s rock guitar, not only for the echo, but for it's preamp circuit; many guitarists, including Jimmy Page, Brian May, and Eddie Van Halen, bypassed the delay and used the FET-based preamp to boost their guitars into their amp inputs as a form of overdrive (modern pedals such as the Xotic EP Booster and Dunlop EP101 provide this in more compact form). The Norlin company, which had just acquired Gibson, took over distribution of the Maestro brand as well, and the EP-3 was soon everywhere, from stage to studio. Maestro EP-3 Echoplex (left), and Jimmy Page literally leaning on his EP-3 in 1975 (right). 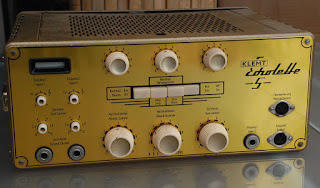 Another great tape echo design of this era was the German Klemt Echolette NG51S, and later the Dynacord Echocord S65 variation. While neither model reached the wide popularity of the Echoplex or Copicat, both were quality units that have their own unique sounds (especially a great tube preamp drive) and devout fans. 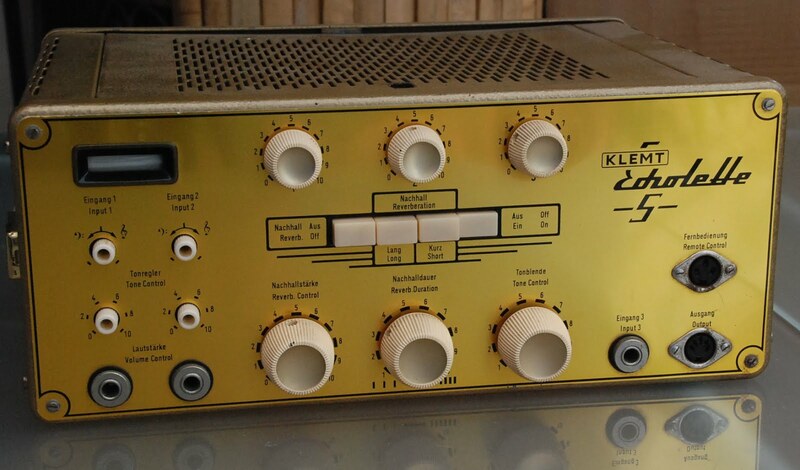 Klemt also made an Echolette amplifier, the M40, used by the Beatles in their early Hamburg Star Club days. At this point, we have to mention two other designs that were not actually tape units, but utilized a rotating drum or wheel to generate a similar effect; the drum contained a magnetic wire which acted as the recording medium, and playback heads fixed around the perimeter of the drum to reproduce the signal as it spun. The Meazzi Echomatic was used with great success by Hank Marvin of The Shadows, particularly on their hit "Apache" in 1960, leading Vox to import and rebrand the design as their own Vox Echo (with endorsement by the Shadows). Meazzi would soon switch to a tape loop, as the rotating drum proved unreliable in their initial design. 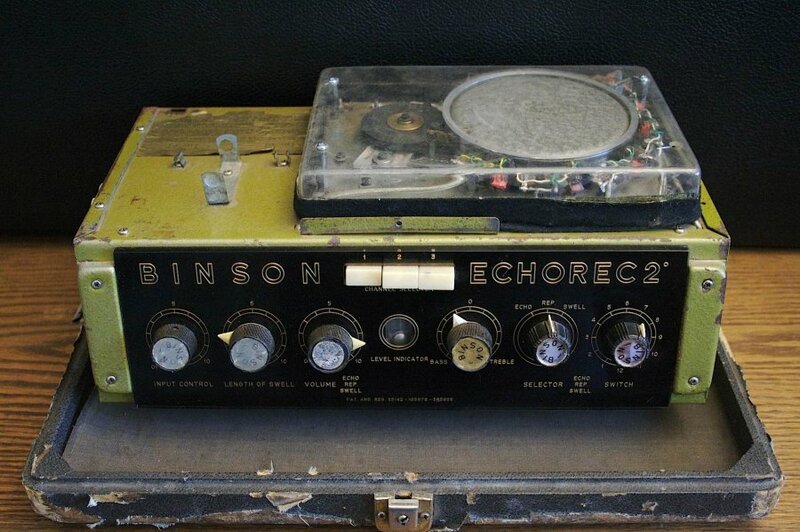 Another Italian product, the Binson Echorec, was used extensively by both Syd Barrett and David Gilmour of Pink Floyd, from their beginnings up through 1977; the Echorec 2 is considered an integral part of Gilmour's sound on the legendary recordings of that era, particularly Dark Side of the Moon, and a highly collectible piece of equipment by vintage enthusiasts. Gilmour also used the studio-grade PE 603 and smaller Baby models. 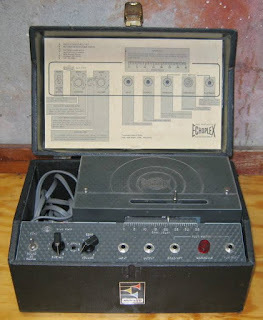 The Echorec 2 was licensed to Guild in the US, relabeled as the Guild Echorec by Binson, but otherwise identical to the original. 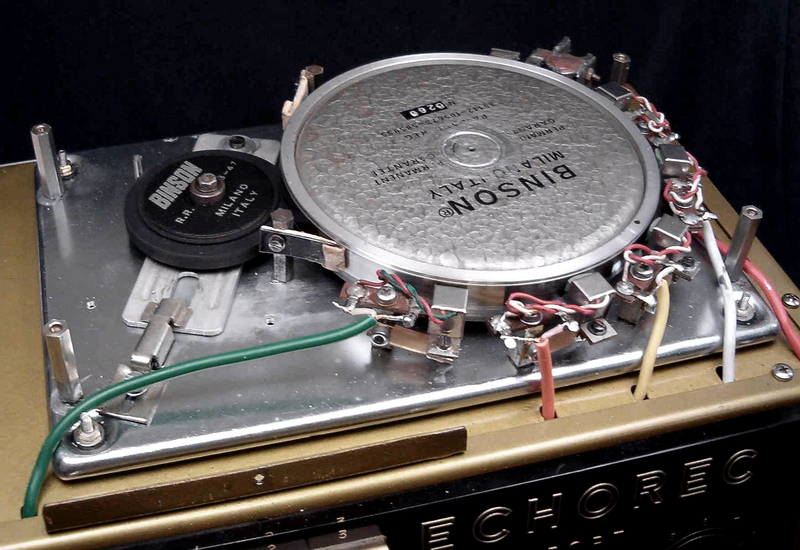 Under the hood of a Binson Echorec with rotating drum exposed. Note the heads around perimeter. 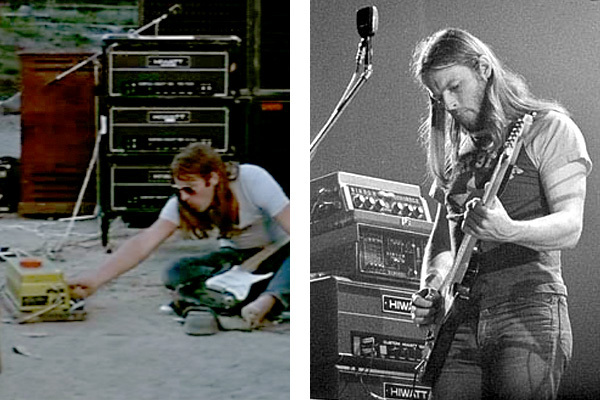 Gilmour playing with his Echorec 2 (left), and a live shot with his Echorec 2 atop a PE 603 (right). 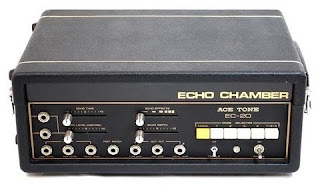 The next major player in the tape echo game came from the Land of the Rising Sun; Ikutaro Kakehashi of Osaka, Japan, started the Ace Tone company in the late 1960s, developing a unit called the EC-1 Echo Chamber along with other innovative products like the FR-1 Rhythm Ace electronic preset drum machine. 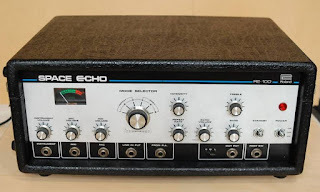 Kakehashi founded the Roland Corporation in 1972, and soon a series of multi-head tape echoes began to evolve, starting with the RE-100 and RE-200 models (the 200 adding spring reverb along with the delay effect). 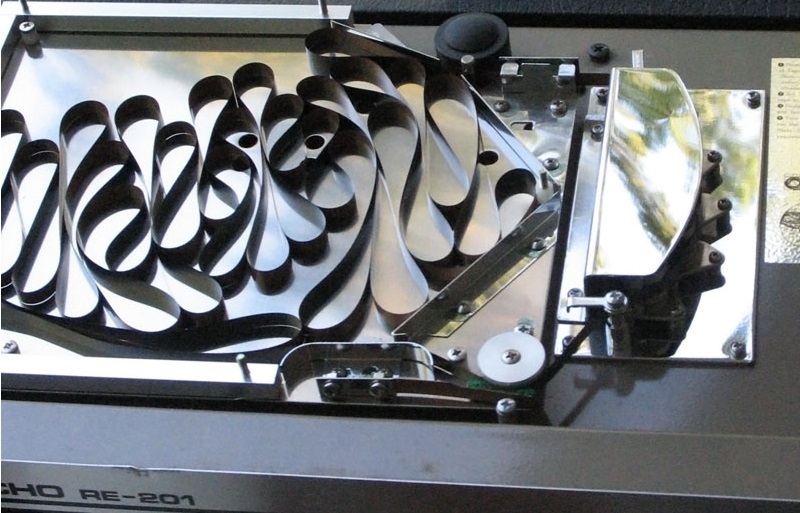 His major breakthru occurred in 1974 with the RE-101 and RE-201 Space Echo models, when Kakehashi abandoned the traditional motorized reel for an open-reel free-running tape loop, letting the 1/4" tape move freely in a "tape tank" cartridge-like enclosure, relying on capstan drive to feed the tape past the heads. This method increased tape life by not stretching or wearing it out as much as a running reel would, and cut down on noise considerably compared to other units with motorized reels. 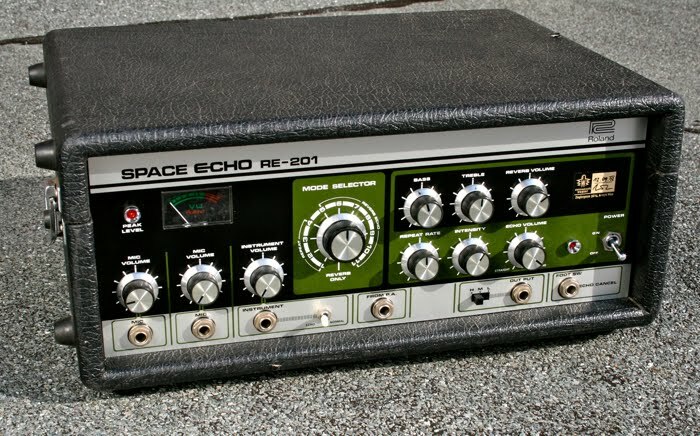 The RE-201 Space Echo was a game changer, still prized by many for it's warm, gritty tone, and ability to self-oscillate in a musically usable fashion. The familiar face of the RE-201 Space Echo (left), and a look at it's open-reel tape operation (right). An RE-301 Chorus Echo (left), and Brian Setzer's rig with a 301 atop one of his Bassman heads (right). 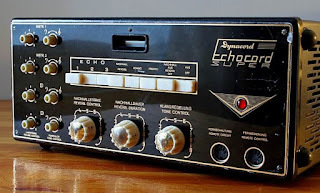 Other Japanese tape echoes of note were the Univox (known for their Super Fuzz and Univibe effects) EC-80a Echo Chamber, Multivox Multi Echo MX-201 and 312 (also rebadged as the Evans Super Echo), and Korg Stage Echo SE-300 and 500. These units can usually be found for lower prices than their Roland or Maestro counterparts, and can be lots of fun to play with. Although digital delays began taking over in the late 1970s, many guitarists preferred the warm tone of these analog tape units, and the entire Roland family of Space and Chorus Echoes became cult favorites over the years. Roland even kind of reissued the RE-201 in the digital form of the Boss RE-20 pedal, utilizing it's patented COSM modeling technology to replicate the tone of the original. Recently, many boutique stompbox builders have produced incredibly convincing recreations of the classics, notably Catalinbread with their Belle Epoch (EP-3 style) and Echorec designs, and Strymon's wonderful El Capistan delay. While these pedals sound great and are much more convenient than their forefathers, nothing beats the sound of an authentic and well-maintained tape echo, at least not to my ears. Just keep some rubbing alcohol and Q-tips handy. Nick's beloved RE-501, hanging out in my home studio. A fitting end to this article, RIP buddy. Good overview! 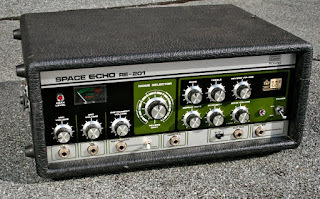 I often run a Roland RE-150 Space Echo in the effects loop of a Rivera S120-210 stereo tube combo amp. With a Gretsch 6120 or Telecaster, rockabilly/country tones don't get much better.